Protect the screen of your iPad Air with a clear film that keeps it free of unsightly scratches and smudges. Kit includes two films, a squeegee and a cleaning cloth. Saffiano finish that makes it soft and smooth to the touch. Sometimes the best solution is the simplest one. That's certainly the case for Simple Folio, a minimalist case for your iPad Air that efficiently protects your device with timeless style. notepads and laptops as a workplace tool. 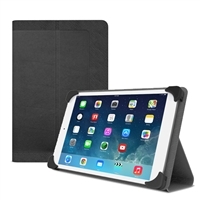 Watch videos and scroll through websites on your iPad Air in comfort with Bolster. This slim case can be used as a stand by folding the cover back and into one of the ridges on the backside. Bolster allows you to choose from multiple different viewing angles for an optimal viewing experience.